We’d love your help. Let us know what’s wrong with this preview of Amy's Windy Tale by Haley Belinda. This is a kid's fun story about a windy day. First from the, 'Through the window series'. Amy has a different occurrence, in each book, that makes her look out of her window! 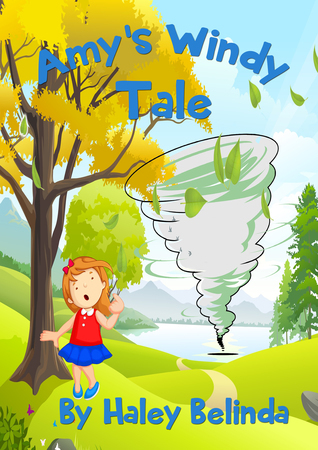 See what happens when the wind blows in this funny tale. This book has 560 words only, designed to help early readers read! Again and again! To ask other readers questions about Amy's Windy Tale, please sign up. Born in Bradford West Yorkshire UK. My Late Mother was from Bronte country and My Late Dad from Castleford area. During my lifetime I have been a nurse, done fitness, been a beauty therapist until I was overcome by fibromyalgia. I read to my children every ni Born in Bradford West Yorkshire UK. My Late Mother was from Bronte country and My Late Dad from Castleford area. I read to my children every night I could and when I couldn't, I would take a turn at each of their bedsides and make up a quick story. Whilst I ran my beauty business, I wrote a memoir in verse but developed fibromyalgia and undergoing tests etc hindered the marketing. It got put on the back burner. I have accepted the 'fibro' now or I am more determined it is not gonna stop me,Ha!Ha! I, therefore, contemplated and thought; I am going to turn those stories into books, so here I am... I enjoy children's story writing which I can do around my condition.